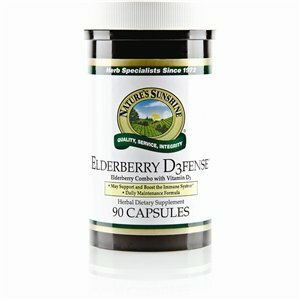 Elderberry D3fense features elderberry extract, vitamin D and echinacea for powerful immune system support. The cloudy winter months (when people receive little sun exposure) are the hardest months for the immune system. During these times, people are less likely to have needed levels of vitamin D, the sunshine vitamin. Elderberry D3fense is a unique blend specifically formulated to support the immune system. It contains a healthy dose of vitamin D3, which mounting research indicates strengthens the immune system, along with key ingredients elderberry fruit extract and Echinacea purpurea. Elderberry D3fense also contains willow bark extract, which contains salicin; olive leaf extract, which features oleuropein, the substance in olive wood that helps protect the tree; and royal jelly, a nutrient-dense substance secreted by the honey bee and containing fats, carbohydrates, amino acids and vitamins. 2,000 IU vitamin D3, elderberry fruit extract, echinacea aerial parts, willow bark extract, royal jelly and olive leaf extract.